How do I replace my Razer Nabu Watch’s battery? My Razer Nabu watch is reporting a Memory Full error. Please log into the NABU App on your phone and sync it with your watch. This should eliminate any memory issue within your Razer Nabu Watch. 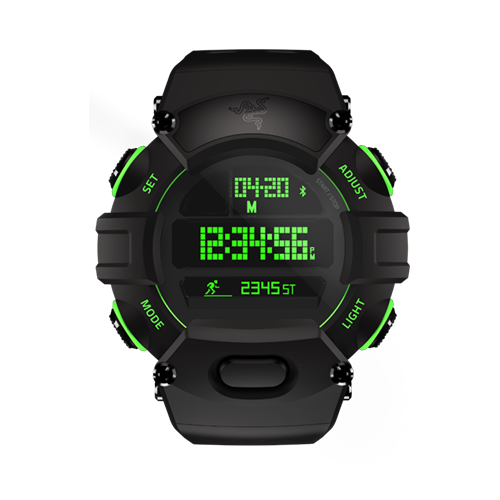 Why does the Razer Nabu Watch’s digital watch face and secondary screen lighting appear different? The digital watch component utilizes a low-power LCD. This vastly improves the battery life performance of both the digital watch and secondary screen components, as well as provide great direct sunlight legibility. In contrast, the secondary screen component utilizes an OLED to drive the crisp clear text and image readouts. OLEDs are emissive and as such, will appear far brighter than their LCD counterparts. What is the battery life of the Nabu Watch? The battery on my watch has died. How do I replace it? It is advised that you take your watch to a local watch dealer to have the coin cell battery (part number C2032) replaced by a professional. Great care should be taken when replacing the battery as you do not want to damage the watch or adversely affect the water resistant quality of the watch. Razer cannot be responsible for any damage caused when changing the battery. Do contact Razer Support if there are further battery related questions. I just set the Watch’s time and date in the app – but I don’t see it reflected on the Watch itself? Why does the Nabu secondary screen’s time function not mirror the Digital Watch’s time? c. We also designed it such that the Nabu and Watch times are controlled separately to allow for users who wish to set the watch time to their own personal preferences (example: placing the watch +5min to always be early to meetings; or in a different time zone). The Nabu Watch is water resistant to 50m depth. It is not recommended to submerge the watch in water for longer than necessary but you can certainly shower and run in the rain with it. Why does my Nabu secondary screen not sync or receive notifications again after a Firmware Update? Why does the Nabu secondary screen not show the correct time when I’ve restarted my device after the battery had gone flat? There is a chance that if the Nabu secondary screen has been left discharged for an extended period of time, the clock may not show the current time. Charge and sync your Nabu secondary screen with the companion app to get the current time back. What is the diamond display on the private message screen? For emojis not supported by the display. I was traveling overseas, and I suddenly lost data in the app. What happened? Fret not, it’s just a momentarily loss of data due to change in time zone. The data will be re-downloaded momentarily. Why am I able to connect the Nabu Watch to the WeChat app but unable to pair to the Nabu app? WeChat’s Bluetooth control sometimes interferes with the band. Disconnect the band from the WeChat app, turn off Bluetooth, kill the WeChat app, and then re-connect the band to the Nabu app. Why is the wrist turn to wake screen functionality not working? Check if the watch is in Sleep mode. Why do I receive a notification on the screen, but it doesn’t vibrate? Check to see if the Watch is in Sleep mode or if the vibration setting has been turned to Off. Why does the fitness counter shown on the screen become a smaller value? Check if you’ve accidentally started Stopwatch mode. Stopwatch mode starts the steps counting from 0 during that session. Turning off Stopwatch mode will add the steps during that session to the total number taken throughout the day, and you should see your complete value again. How do I set the time for sleep mode? Sleep tracking is now automatic. All you have to do is fall asleep, and the Nabu Watch will automatically begin sleep tracking. Alternatively, you may tap on the Sleep bar on the Dashboard to pull up the detailed Sleep section, and hit the Plus sign in the top right corner. There is a Begin Sleep Now button to allow you to tell the Nabu Watch to manually start sleep tracking. Or you can manually input the time slept using Add Sleep Log. During automatic sleep mode, the Nabu Watch records each minute your body is at rest once you’ve fallen asleep. Each significant movement such as rolling over will inform the Nabu Watch that your rest is interrupted. This does not necessarily mean that you are fully awake or aware of your movements however it may indicate that you are not getting the most out of your sleep time. Based on this data, you can determine if you are well rested or not. Why is my sleep data not being synced to the app after every night? If you left your Watch unpaired to your phone when you sleep, the app may not reflect the sleep data when you re-pair to the phone the following day. We advise you to keep the Watch paired to the phone even as you sleep to ensure proper data sync. We’re looking into improving this one. Do I need to restart my Nabu Watch? To restart the Nabu Watch, simply plug it into a power source, press and hold the button on the device. Why does syncing between the Nabu Watch and the Nabu app take very long? If there are long periods of unsynced data, re-syncing is expected to take awhile. However, users can still continue using the app while syncing is in progress. Your mobile device’s Bluetooth may also cause issues for syncing. Try restarting the Bluetooth function, and re-syncing to see if that fixes the issue. What is the difference between Do Not Disturb and Sleep mode? Do Not Disturb disables incoming notifications and band vibrations. Sleep disables incoming notifications, band vibrations and starts sleep tracking. Why do I not receive any notifications on the Watch even if I have completed a fitness goal, changed band settings, and can receive live data in the app? This is an issue with iOS. Restart your phone and see if the issue still persists. Why is my past day’s data not being updated on the Dashboard and Week List even after syncing to the Watch? Kill and restart the app to update the Dashboard’s data. I’m having trouble syncing the Nabu Watch to my fitness app, why? Can I sync more than one Nabu device to a single iPhone? No, the Nabu app allows you to only maintain one Nabu device per account. Why is it not syncing with the Nabu app? i. Make sure that your iPhone is officially supported. ii. Make sure your operating system is iOS 8 or higher. iii. Make sure that your iPhone has Bluetooth enabled and is paired to the Nabu Watch. iv. Check if an existing sync is not in progress. You can check if the Nabu Watch is already syncing with your iPhone by opening the Nabu app and checking the Device screen. The screen will tell you the last time the Nabu Watch was synced and will also tell you if syncing is in progress. The time to complete a sync will vary, and may take up to 30 minutes or more if the time from last sync is more than 5 days. 2. Swipe up to remove the Nabu app from the list. 3. You may need to log back into your account after a Force quit. vi. Multiple devices connected to the iPhone’s Bluetooth (i.e. speakers, other trackers) may interfere with the BT function of the Nabu Watch. If you’re still unable to sync after these troubleshooting steps, please contact Razer Customer Support at www.razerzone.com/contact-us for further assistance. I am experiencing unexpected increase in the daily step count in Nabu app. Please log out and log in again with your RazerID account on your Nabu app to fix this. Why can’t I control the music player’s Play/Pause/Next/Previous functions when using the Phone Remote Control mode on the watch? In some cases, the commands are not picked up by Google’s Play Music app, and it is a rare occurrence for some phone models (i.e. Oppo Find 7). If this occurs for you, go to your Android device’s System Settings > Apps > Google Play Music > Force Stop and then retry. Why is the total number of steps shown in the Google Fit app incorrect? The sum added up from the charts on Google Fit match with the data on the Nabu app. This is a rare occurrence for some Google Fit accounts. Why does the Google Fit data not match up with that shown on the Nabu’s app? There is a 30 – 60 minutes delay in Google Fit reading the fitness data from Nabu’s servers. If Activity Detection in the Google Fit app is enabled, it may cause a discrepancy too as Google Fit is collecting data of its own accord. We advise turning off Activity Detection, to allow the Nabu to be the primary fitness data recorder. Why do I not receive any notifications on the Watch even if I have completed a fitness goal, changed band settings, or can receive live data in the app? This is an issue with Android. Restart your phone and see if the issue still persists. Why am I able to receive notifications, get live data on the app, but changing secondary screen settings on the app does not reflect on the Watch? This is an intermittent issue with Android devices. Restart Bluetooth functionality and see if the issue still persists. Can I sync more than one Nabu device to a single Android device? i. Make sure that your Android device is officially supported. ii. Make sure your operating system is Android 4.3 or higher. iii. Make sure that your Android device has Bluetooth enabled and is paired to the Nabu Watch. iv. Check if an existing sync is not in progress. You can check if the Nabu Watch is already syncing with your Android device by opening the Nabu app and checking the Device screen. The screen will tell you the last time the Nabu Watch was synced and will also tell you if syncing is in progress. The time to complete a sync will vary, and may take up to 30 minutes or more if the time from last sync is more than 5 days. 2. Tap the Multitasking button. 3. Swipe the Nabu app left or right to remove it from the column. 4. You may need to log back into your account after a Force quit. vi. Make sure your Android device is not in Power Saving mode. You can view this by going to the Settings app on your Android device.